From New York, to London, to Cuba, secret supper clubs and pop-up restaurants offer an alternative dining experience for those looking for something new, fun and exciting. 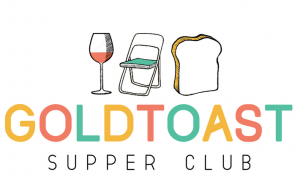 Goldtoast, based on the Gold Coast, is a small popup restaurant with roving premises, where guests eat from a set menu and are expected to fraternise with other guests who they may not know… it all seems quite fun doesn’t it? The next dinner we are hosting is linked with the current exhibition being held in the gallery at the Kirra Hill Community and Culture Centre, Christopher McKenzies “Masculine Coma”. If you’d like more information on this dinner visit goldtoastsupperclub.blogspot.com or like us on facebook!